Below are the complete details of the Technician jobs in Sayed Abdullah Shah Institute Of Medical Sciences in Sehwan. Skills Required for Job: Listening, Speaking and writing & Analytical and Problem solving skill. Reading comprehension. Business skills. Customer service skills. It might seem obvious, but not everyone has an innate sense of mechanics. 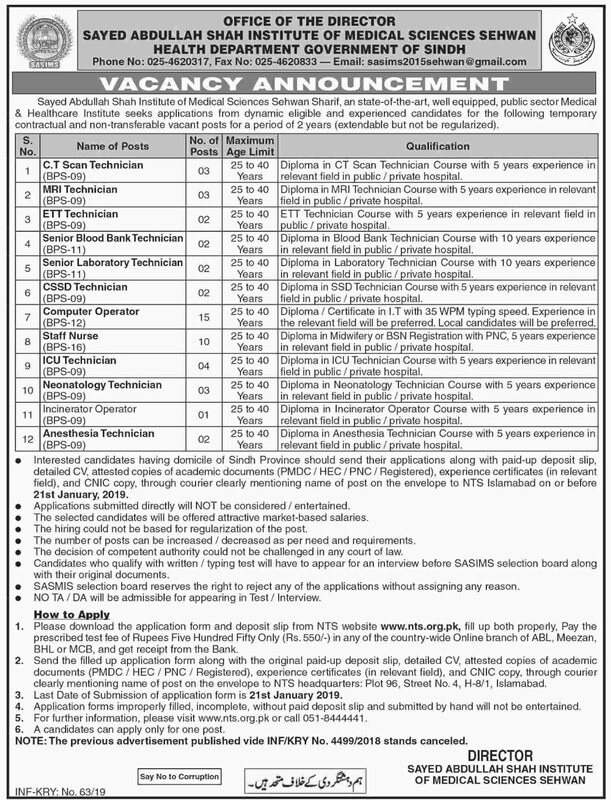 Qualification: Sayed Abdullah Shah Institute Of Medical Sciences Jobs for Technician Qualification:- Candidates should be at least Diploma Degree Holders & Minimum Experience:-Preferably have 05 years of working experience in the field interested candidates fulfilling the above criteria can apply at following address by 21 January 2019 incomplete documents/late application after due date will not be acceptable. 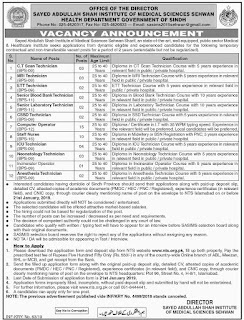 Technician jobs in Sayed Abdullah Shah Institute Of Medical Sciences Sehwan, in Pakistan published on Paperpk.com from newspaper on January 08,2019. Job seekers who are already working as Electrical Technician , Technician , Fiber Optic Technician , AC Technician , Mechanical Technician , Automobile Technician , Security Technician , CCTV Technician can also apply for post of Technician.